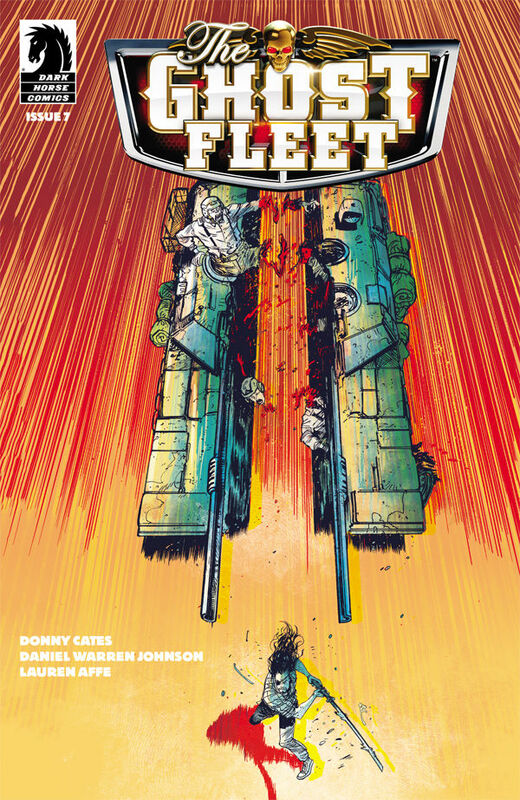 Ghost Fleet 7 is so good that I don’t have a lot to say about it besides: “Go pick it up if you have 1-6” and “Buy them all if you’re not reading this already”. Cates and Johnson have realized their full potential with this seventh issue and that potential is one of earth shattering, high octane, “maximum overdrive” type proportions. Everything that this explosive series has been leading to is unleashed here in a rain of hellfire and a hail of bullets. Every ounce of cynicism, nihilism and mediation on the condition of man as a hero and villain that Cates has intricately and carefully woven into the dialogue and story of this comic is touched upon here both verbally and physically with equal weight. All of the secrets and mysteries revealed, here and forever, in a way I never would’ve expected but one that also totally works. Every bullet, punch and slice orchestrated previously by Daniel Warren Johnson pales in comparison to this, his magnum opus of sorts. Men, monsters, guns, swords, and….trucks all brought to life in incredible, visceral and gritty stylings by a master at work in perfect tandem with an excellent writer. I’ve never re-read a comic as soon as I was finished with it before. This time I did.